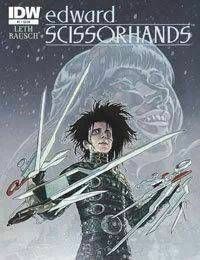 In castle just outside a sleepy suburban town, a brilliant inventor created Edward Scissorhands…but left him tragically unfinished. Two generations of exile have left Edward digging through abandoned experiments, but once he wakes up a creature left buried, he discovers he isnt the only one missing a vital piece. As Edward tries to fix a grave mistake, he comes face to face with a teenage girl who was sure he was only myth... despite the stories her grandmother told her, about the man she could never touch.